Zap Comix, No. 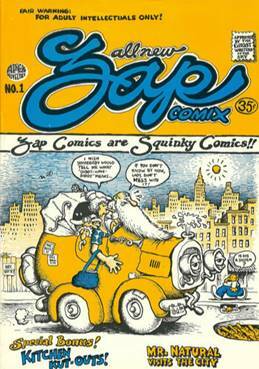 1 (1967), by R. Crumb. Part of Beyond the Cape, opening at the Boca Raton Museum of Art on April 16. Ann Norton Sculpture Gardens: Through May 5: An Eye for Nature: Paintings and Prints by Morton Kaish, works by the American artist and former SUNY professor. Main gardens are open Wednesday to Sunday 10 am to 4 pm. Admission: $15, $10 for seniors, $7 for students. Call 561-832-5328 or visit www.ansg.org. Armory Art Center: April 13-20: Photo Exhibition from Grassy Waters; winning photos from a contest to depict the Grassy Waters Preserve. Open 9 a.m. to 4 p.m. Monday through Friday, 9 a.m. to 2 p.m. Saturday. $5, non-members. Call 561-832-1776 or visit www.armoryart.org. Boca Raton Museum of Art: Opens April 16: Beyond the Cape! Comics and Contemporary Art, an exhibit that shows how comic books have influenced contemporary artists, through Oct. 10; Contemporary Sculpture: Sam Anderson and Michael Dean, works by the American and British artists; through Oct. 10. Opens April 16: John Ransom Phillips: The Lives of the Artists, watercolor interpretations of artists Phillips is interested in, through Aug. 11. Admission: $12, seniors $10, children 12 and under, free. Hours: 10 a.m. to 5 p.m. Tuesday, Wednesday and Friday; 10 a.m. to 8 p.m. Thursday; 12 p.m. to 5 p.m. Saturday and Sunday. Closed Mondays and holidays. Call 561-392-2500, or visit www.bocamuseum.org. Cornell Art Museum: Opens April 25: Seven Solos, site-specific installations commissioned for the museum’s recently revamped space. Through Oct. 6. Museum hours: Tuesday-Saturday, 10 am-5 pm. Closed Sundays, Mondays and holidays. Admission: $8; $5 seniors and students with ID; free for veterans, children under 12, and Old School Square members. Call 561-243-7922 or visit www.oldschoolsquare.org for more information. Cultural Council of Palm Beach County: Through May 18: Modern Love, works by 20 Palm Beach County artists exploring the subject of amour. Through April 27: Solo exhibitions by Janet Siegel Rogers and Shannon Torrance. Galleries at the council offices in Lake Worth are open from 10 a.m. to 5 p.m. Tuesday through Saturday; free admission. Call 471-2901 or visit palmbeachculture.com. Flagler Museum: Through May 26: Maker and Muse: Women and Early 2oth-Century Art Jewelry, a collection of more than 200 pieces of handcrafted jewelry, including by Tiffany and Lalique, that demonstrates the effect women had on their creation, including as designers. Hours: 10 a.m.-5 p.m. Tuesday through Saturday, noon to 5 Sundays. Closed Mondays and holidays. Admission: $18. Call 655-2833 or visit flaglermuseum.us. Lighthouse ArtCenter:. Opens April 8: 41st Annual Members Show and Sale, works by members of the Tequesta-based center. Through April 25. Admission: $10 for adults, free for members and children 12 and under. 10 am to 4 pm. Monday through Friday, 10 a.m. to 2 p.m. Call 561-746-3101 or visit www.lighthousearts.org. Morikami Museum and Japanese Gardens: Opens May 4: Falling Water, Soaring Kites, an exhibit from the museum’s collections focusing on art featuring waterfalls and kites, frequent themes of Japanese art beginning in the 18th century. Through Aug. 11. Museum tickets: $15, $13 for seniors, $9 for children and college students. Open 10 a.m. to 5 p.m. Tuesdays through Sundays. Call 495-0233 or visit www.morikami.org. NSU Art Museum Fort Lauderdale: Through May 19: William J. Glackens and Pierre-Auguste Renoir: Affinities and Distinctions, 25 works each by the American and French masters, showing how Renoir’s work influenced Glackens. Admission: $12; hours: 11 am-5 pm Tuesday through Saturday, 11 a-8 pm every first Thursday, noon-5 pm Sunday. Call 954-525-5500 or visit nsuartmuseum.org. Palm Beach Symphony: The legendary American pianist Leon Fleisher joins the orchestra for an early Mozart concerto (No. 12 in A, K. 414); Ramón Tebar also leads the band in the Symphony No. 7 of Anton Bruckner. 8 pm, Kravis Center. Tickets start at $35. Call 832-7469 or visit kravis.org. Lynn Philharmonia: Mezzo-soprano Rebecca Robinson sings Berlioz’s La Mort de Cleopatre; conductor Guillermo Figueroa also leads the orchestra in the Leonore Overture No. 3 of Beethoven and the Concerto for Orchestra of Bela Bartok. 7:30 pm Saturday, 4 pm Sunday, Wold Performing Arts Center, Lynn University, Boca Raton. Tickets: $35-$50. Call 237-9000 or visit www.lynn.edu. Rachel Kudo: The American pianist returns to the Piano Lovers series hot on the heels of her win in the 2018 Bach Competition in Leipzig with a program of Bach (including the Italian Concerto), Schumann (Carnaval) and Clara Schumann (Variations on a Theme by Robert Schumann, Op. 20). 4 pm, Boca Steinway Gallery. Tickets: $30; visit pianolovers.org. Escher String Quartet: The American quartet presents a world premiere by the American composer Andrew Norman, on a program with the String Quartet by Samuel Barber and the String Quartet No. 12 (in F, Op. 96) of Dvorak. Part of the Chamber Music Society of Palm Beach series. 7 pm, Norton Museum of Art, West Palm Beach. Tickets: $75; call 379-6773 or visit cmspb.org. Amernet String Quartet: St. Paul’s music director Paul Cienniwa joins the Miami-based foursome for harpsichord quintets by Soler and Gorecki; also on the program is the String Quartet No. 15 (in A minor, Op. 132) of Beethoven. 4 pm, St. Paul’s, Delray Beach. Tickets: $20 suggested donation at the door. For more information, visit www.maspconcerts.org. Zimmermann’s Café Chamber Music: The nonprofit series devoted to contemporary music by South Florida composers hosts its sixth concert, featuring works by Shawn Crouch, Federico Bonacosa, Marlene Woodward, Kristine Burns and Thomas Sleeper. 4 pm, St. Andrew’s Episcopal Church, Lake Worth. Donation: $20. Refreshments included; visit Zimmermann’s Café Chamber Music on Facebook for more information. Miami City Ballet: The Miami Beach-based company wraps its season with A Midsummer Night’s Dream, Balanchine’s ballet to the music of Felix Mendelssohn. 8 pm Friday; 2pm and 8 pm Saturday; and 1 pm Sunday at the Kravis Center. Tickets start at $29. Call 832-7469 or www.kravis.org. Boca Ballet Theatre: Dan Guin and Jane Tyree’s company presents Romeo and Juliet, the great Prokofiev score, with guest dancers from the Pennsylvania Ballet joining the troupe’s young dancers. 7:30 pm Friday and Saturday, 2 pm Sunday, Olympic Heights High School, Boca Raton. Tickets: $40-$50. Call 995-0709 or visit www.bocaballet.org. The Dancers’ Space: A program of contemporary dance works assembled by create.Dance.florida. 8 pm Duncan Theatre, Palm Beach State College, Lake Worth. Tickets: $15-$25. Call 868-3309 or visit www.palmbeachstate.edu. NoGravity Dance Company: Emiliano Pellisari’s troupe presents From Hell to Paradise, in which six dancers float through the air in an evening that features technological wizardry and a wide range of music. 8 pm, Kravis Center. Tickets start at $25. Call 832-7469 or visit www.kravis.org. Year by the Sea: Alexander Janko’s 2016 film about a long-married woman who decides to relocate to Cape Cod by herself when her husband gets a new job in Kansas. With Karen Allen, Yannick Bisson and Celia Imre. 2:30 and 6 pm, Society of the Four Arts, Palm Beach. Tickets: $5. Call 655-7226 or visit www.fourartsorg. Sunset: Laszlo Nemes’s 2018 drama is set in the Budapest of 1913, where a young woman hopes to work at the millinery store her parents once owned, but is turned away as a man comes looking for another man he says is her brother. With Susanne Wuest and Vlad Ivanov. In Hungarian with English subtitles. Living Room Theaters, Boca Raton. Call 561-549-2600 or visit fau.livingroomtheaters.com. Diane: Mary Kay Place stars in Kent Jones’s 2018 film about a woman who gives of herself to her friends, community and family but is haunted by a past she can’t forget. Living Room Theaters, Boca Raton. Call 561-549-2600 or visit fau.livingroomtheaters.com. On Our Merry Way: King Vidor directed this 1948 film scripted by John O’Hara about a newspaper classified ads clerk who pretends to be a reporter in order to ask his paper’s question of the day. With Burgess Meredith, Paulette Goddard, Henry Fonda and Jimmy Stewart. 2:30 and 6 pm, Society of the Four Arts, Palm Beach. Tickets: $5. Call 655-7226 or visit www.fourartsorg. Wagner: Over two days, the entire 8-hour 1983 miniseries starring Richard Burton as the controversial 19th-century German composer who changed the world of opera and the arts for good. With John Gielgud, Ralph Richardson, Laurence Olivier and Vanessa Redgrave. 12:30-4:30 pm both days, Society of the Four Arts, Palm Beach. Free admission. Call 655-7226 or visit www.fourartsorg. Peterloo: Director Mike Leigh chronicles the Peterloo Massacre of 1819, in which British troops mowed down a giant demonstration for rights in Manchester, England. Living Room Theaters, Boca Raton. Call 561-549-2600 or visit fau.livingroomtheaters.com. Stanley Jordan: The great jazz guitarist does two shows in Delray Beach. 8 pm both nights, Arts Garage. Tickets: $45-55. Call 450-6357 or visit artsgarage.org. Carol Welsman Trio: The Canadian singer and pianist is a six-time Juno Award winner. 7:45 pm, Broward Center for the Performing Arts. Tickets: $55. Call 954-462-0222 or visit browardcenter.org. Troy Roberts and Nu-Jive: The Australian saxophonist and composer is joined by his Nu-Jive Perspective for a night of funk- and soul-influenced jazz. 8 pm, Arts Garage, Delray Beach. Tickets: $35-45. Call 450-6357 or visit artsgarage.org. Mojo Ike and Val Experience: The Miami-based blues duo of Ike and Val Woods has recently released a recording called Movin’ Up. 8 pm, Arts Garage, Delray Beach. Tickets: $30-40. Call 450-6357 or visit artsgarage.org. Werther: Florida Grand Opera ends its season with Jules Massenet’s 1892 weepie based on a book by Goethe that tells of a young poet who falls desperately in love with a woman promised to another. With Dmitri Pittas, Daniela Mack, Evan Kardon and Benjamin Dickerson. Six performances; four in Miami and two in Fort Lauderdale. Call 800-741-1010 or visit fgo.org for ticket information. DMX: Fresh out of a year in prison for tax fraud, the rapper born Earl Simmons celebrates the 20th anniversary of his breakthrough album, It’s Dark and Hell Is Hot. 8 pm, Revolution Live. Tickets start at $35; the show is currently sold out, but returns are always possible. See ticketmaster.com for more information. Boz Scaggs: The veteran singer, guitarist and songwriter (“Lido Shuffle,” “Look What You’ve Done to Me”) released a new recording last year. 8 pm, Kravis Center. Tickets start at $29. Call 832—7469 or visit www.kravis.org. Bernadette Peters: The diminutive Broadway star and singing powerhouse offers an evening of music from the Great White Way. 8 pm, Kravis Center. Tickets start at $25. Call 832—7469 or visit www.kravis.org. Santana: The revered band led by guitar icon Carlos Santana made its first big splash in the late 1960s. 8 pm, Seminole Hard Rock, Hollywood. Sold out, but with select resale tickets ranging from $246-$1,200. Visit ticketmaster.com or www.seminolehardrockhollywood.com. Psychedelic Furs: The British sextet let by Richard Butler can trace its roots to 1977’s punk scene; the band’s hits include iconic 1980s songs such as “Love My Way” and “Pretty in Pink.” 8 pm, Culture Room, Fort Lauderdale. Tickets: $45; visit ticketmaster.com. Whitesnake: The big-hair British arena band led by David Coverdale (“Here I Go Again”) was founded in 1978 and is currently on its Flesh and Blood tour. 8 pm, Seminole Hard Rock, Hollywood. Tickets start at $35. Visit ticketmaster.com or www.seminolehardrockhollywood.com. Newsboys and Michael W. Smith: A night of Christian rock with the Australian band and the American singer-songwriter. 6 pm, Coral Sky Amphitheatre on the South Florida Fairgrounds. Tickets start at $33.50; see livenation.com. Showtune: The Music of Jerry Herman: A revue of the Broadway composer’s hits from iconic shows such as Hello, Dolly!, Mame and La Cage aux Folles. Delray Beach Playhouse. Tickets: $30. Call 272-1281, ext. 4, for tickets or visit delraybeachplayhouse.com. Sweet Charity: Cy Coleman’s 1966 musical about a dance hall hostess with a comically turbulent love life has a book by Neil Simon and familiar songs such as “If My Friends Could See Me Now” and “Hey, Big Spender.” Through April 28 at Lake Worth Playhouse. Call 561-586-6410 or visit lakeworthplayhouse.org for tickets. Crazy for You: The 1992 reassembly of a Gershwin musical, largely based on Girl Crazy (1930) and having to do with the adventures of a young man who wants to be part of the Zangler Follies. With Matt Loehr. Wick Theatre, Boca Raton. Call 561-995-2333 or visit thewick.org. Harlowe: The world premiere of a play by Jennifer Lane, workshopped four years ago at FAU, about a woman who suffers a physical trauma and must slowly heal. FAU Theatre Lab, Florida Atlantic University, Boca Raton. Tickets: $35. Call 297-6124 or visit fau.edu/artsandletters/theatrelab. West Side Story: Leonard Bernstein’s classic 1957 musical retelling of Romeo and Juliet, retooled for a fresh angle on the Puerto Rican toughs. At Maltz Jupiter Theatre, Jupiter. Call 575-2233 or visit jupitertheatre.org. Rent: Jonathan Larson’s 1996 musical of bohemian life in the East Village of New York, based on Puccini’s La Bohème. 8 pm, Kravis Center. Call 832-7469 or visit www.kravis.org. Fences: August Wilson’s tale of a Pittsburgh sanitation worker in the 1950s still embittered about losing his chance at baseball stardom has become an American classic. With Lester Purry and Karen Stephens. At Palm Beach Dramaworks, West Palm Beach. Tickets: $75. Call 514-4042 or visit www.palmbeachdramaworks.org. The Lion King: The beloved Elton John-Tim Rice musical based on Disney’s 1994 film about a young lion named Simba whose evil uncle Scar wants to take over Simba’s rightful throne. Through May 5. Kravis Center; call 832-7469 or visit www.kravis.org.